It’s almost 2016 – and you may find yourself wondering about your future, your direction and how you’re going to approach your life in the coming year. Do you feel expanded and inspired, ready to move forward – or are you feeling contracted, confused, stuck, worried or apprehensive? If you’re feeling fearful, confused, worried or stuck, being in your head is like being in a bad neighborhood. Don’t go in there alone!! When you’re in the fear/worry “loop” (and it is a loop! ), you go over and over the same scenario, falling deeper into a state of contraction and tunnel vision, which makes it impossible to connect to your expanded, creative, vibrant, Authentic, Higher Self! When you’re in contraction you’re in a childhood wound or a blind spot — something you came here to learn about and ultimately to transcend. When you are in the dark you can’t see the BIG picture or the opportunities and possibilities that await you! You pull your energy in, choose security and play it safe, staying small and maybe even checking out. In that state of mind, playing it safe actually keeps you trapped. If you had a magic wand and there were no limitations, what would change in your life? Do you want to shift aspects of yourself and your life, but don’t know how? Has your life been turned upside down in some way and you’re not sure where you are or how to move forward? Are there parts of you that are stuck in an old story that you just can’t seem to shake? Are you still attached to limiting beliefs about yourself that you will actually defend if challenged (be honest!)? Are you so overwhelmed or stressed out by your life setup that “peace” feels like a foreign concept? Are other peoples’ needs and priorities more important than yours? Do you spend too much time in your head trying to figure things out (to no avail)? Are you hiding in some socially acceptable role (Mom, caretaker, teacher) while your Authentic Self is crying out for expression? Do you start off with a bang and then take yourself out of the game, one way or another? Are you in a security “trap” – in a job you really don’t love, just for the $$ and don’t know how to get out? Are you sick, run down, soul weary and/or physically exhausted? Do you think that other people have miraculous breakthroughs or awakenings, but it won’t happen for you? Are you lacking support, care, inspiration or direction? Embody “Higher Self” expression consistently (operating from a radiant, empowered, loving energy, rather than a people-pleasing energy) to create more of what you want? Learn the secret of creating inner peace (that few people really know!)? Connect clearly with your inner guidance and feel confident to follow the messages you receive when making decisions? Release fear, worry and other debilitating energetic patterns? 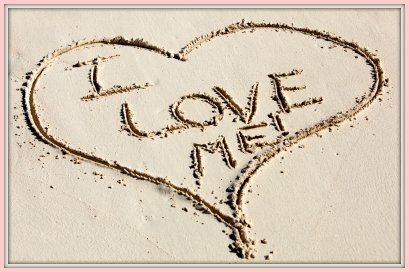 Learn to love yourself more, with less judgment and unconscious punishment? Feel safe to know and speak your truth – and learn how to stand in your power? Transform the way you feel about yourself inside? You are your worst critic. Have a whole new perspective around making choices that is HIGHLY empowering, releasing the need for others’ approval? Operate with a high level of integrity while feeling more centered, empowered and joyful? Connect with your body in new ways, creating greater vitality and physical well being? Be able to move through the world with greater clarity and ease? Magnetize the right and perfect people into your life (and de-magnetize the others out)? Be inspired to release self-judgment and judgment of others organically, authentically and lovingly? Have balanced and loving relationships in which you’re treated with honor and respect? Create a life that truly nurtures and supports you? This is the time to awaken, grow, heal and evolve. With that in mind, I have created a 12-week program, in which I’m sharing my teachings and guidance with you – offering you new perspectives and a “Higher Self” approach to life that I’ve acquired over my 20+ years of conscious spiritual growth and transformation (which is always ongoing!). Align with your Authentic/Higher Self. Yes friends, I’m giving it up! You will have my material in writing to keep forever, a reference guide for life. Remember, Universal Laws and truths don’t expire! A Weekly Written Module – a presentation of powerful content that will activate and awaken your consciousness – that will inspire you and teach you HOW to align with a new level of beingness in your life. 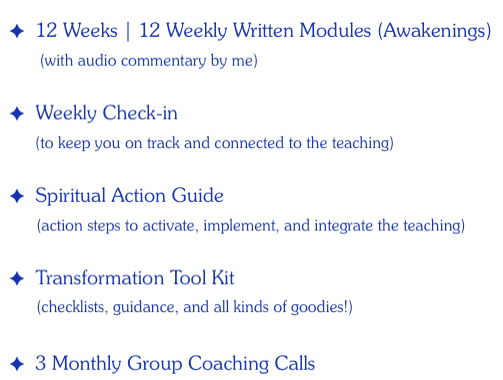 Spiritual Practices (action steps) so that you can activate, implement and integrate each weekly teaching into your consciousness and daily life. A Weekly Check-in (assignment) to support you in connecting to the teaching. A Transformational Tool Kit with checklists, guidance and other goodies you’ll love! A Personal Astro-Coaching Call to learn the area of life through which your transformation will take place (it’s often so surprising! ), where you are stuck or struggling and how to get through. This is big information that everyone should have – it’s so validating and helpful! 3 Monthly Group Coaching Calls in which I will teach and answer questions. Calls will be recorded and you can email me your questions if you can’t be present. Bonus: Exactly When To Send In Your Tax Returns for 2015! This report has specific dates and times to send in your tax returns and have the least likelihood of being flagged or audited. All astrologers know this and it’s one of my favorite tools! I have created convenient payment plans to make it possible for you to have this course. This is 3 months of ongoing guidance, connection, support and inspiration that will serve you well. Do not pretend that you can go on in your life out of balance and live happily. This is an extremely important time of deciding where you will direct your energies next year. Your creations will be the result of the conscious choices you make now. Do yourself a favor and make this the year you give yourself the gift of support and transformation! I so wish the best for you – and I look forward to sharing my gifts with you in this new way!